Mention the surname Brooks in any cycling circle and immediately minds jump to sumptuous leather saddles and veritable heaps of tradition. Filing his first saddle patent in 1882, Brooks patriarch John Boultbee Brooks, set in motion a chain of events that remains unbroken (although admittedly sporting a kink or two) to this day, forever changing the course of the legacy he would leave to this world. Known for their quality craftmanship and timeless style, the brand has become irrevocably identified by it’s iconic leather perches. 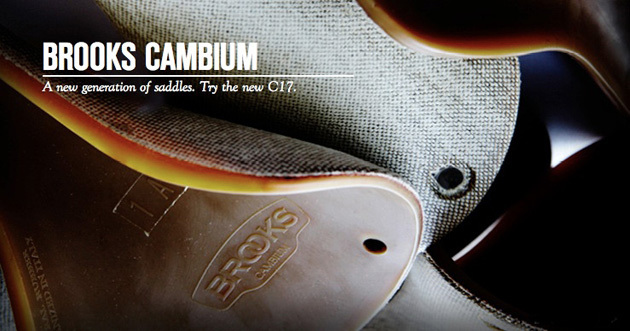 However, in a curious turn of events, Brooks’ latest saddle offering, the Cambium, marks a drastic departure from the company’s tried-and-true traditional formula. Sporting rather atypical construction, the Cambium consists of a naturally-sourced rubber and organic cotton top that has been vulcanized to impart the saddle with a steadfast defense against life’s harsher elements, as well as your posterior—the treatment makes the saddle highly abrasion resistant. While not available to the general public until the official June 17th release date, Brooks has dreamed up an interesting promotion that gives 100 lucky cyclists the chance to get their hands (and posteriors) on a new Cambium B-17 model before the release. Seeking a broad variety riders, both men and women of varying body types and riding backgrounds, Brooks has created an online entry to apply for the pilot program. And, should you think you don’t stand a chance, let us inform you that all entrants receive a 10-percent off coupon to the Brooks online shop—not a bad consolation prize if you ask us. Act fast though, as entry closes on May, 17th.